In general, the word energy refers to a concept that can be paraphrased as "the potential for causing changes", and therefore one can say that energy is the cause of any change. The word is used in several different contexts. The use of the word in mainstream science has a precise, well-defined meaning, which is not the case, most often, with many other usages. The most common definition of energy is work that a certain force (gravitational, electromagnetic, etc) can do. Due to a variety of forces, energy has many different forms (gravitational, electric, heat, etc.) that can be grouped into two major categories: kinetic energy and potential energy. According to this definition, energy has the same units as work; a force applied through a distance. The SI unit of energy, the joule, equals one newton applied through one meter, for example. Energy has no direction in space, and is therefore considered a scalar quantity. Energy is a conserved quantity, meaning that it cannot be created or destroyed, but only converted from one form into another. Thus, the total energy of the universe always remains constant. 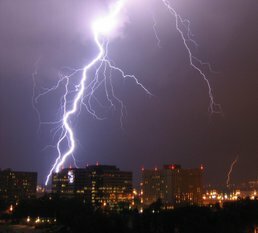 Lightning is a highly visible form of energy transfer. The etymology of the term is from Greek ενέργεια, εν- means "in" and έργον means "work"; the -ια suffix forms an abstract noun. The compound εν-εργεια in Epic Greek meant "divine action" or "magical operation"; it was later used by Aristotle in a meaning of "activity, operation" or "vigour", and by Diodorus Siculus for "force of an engine." The concept of energy, in the distant past, was used to explain easily observable phenomena, such as the effects observed on the properties of objects or any other changes. It was generally construed that all changes could in fact be explained through some sort of energy. Soon the idea that energy could be stored in objects took its roots in scientific thought and the concept of energy came to embrace the idea of the potential for change as well as change itself. Such effects (both potential and realized) come in many different forms. While in spiritualism they were reflected in changes in a person, in physical sciences it is reflected in different forms of energy itself, for example, electrical energy stored in a battery, the chemical energy stored in a piece of food (along with the oxygen needed to burn it), the thermal energy of a water heater, or the kinetic energy of a moving train. In 1807, Thomas Young was the first to use the term "energy" instead of vis viva to refer to the product of the mass of an object and its velocity squared. Gustave-Gaspard Coriolis described " kinetic energy" in 1829 in its modern sense, and in 1853, William Rankine coined the term " potential energy." The development of steam engines required engineers to develop concepts and formulas that would allow them to describe the mechanical and thermal efficiencies of their systems. Engineers such as Sadi Carnot and James Prescott Joule, mathematicians such as Émile Clapeyron and Hermann von Helmholtz , and amateurs such as Julius Robert von Mayer all contributed to the notion that the ability to perform certain tasks, called work, was somehow related to the amount of energy in the system. The nature of energy was elusive, however, and it was argued for some years whether energy was a substance (the caloric) or merely a physical quantity, such as momentum. There is a fact, or if you wish, a law, governing natural phenomena that are known to date. There is no known exception to this law—it is exact so far we know. The law is called conservation of energy [it states that there is a certain quantity, which we call energy that does not change in manifold changes which nature undergoes]. That is a most abstract idea, because it is a mathematical principle; it says that there is a numerical quantity, which does not change when something happens. It is not a description of a mechanism, or anything concrete; it is just a strange fact that we can calculate some number, and when we finish watching nature go through her tricks and calculate the number again, it is the same. — The Feynman Lectures on Physics, Vol. 1. The concepts of energy and its transformations are useful in explaining natural phenomena. The law of conservation of energy is equally useful. The direction of transformations explained with the help of energy is often influenced by entropy considerations also. The transformation that constitutes the context of energy in physics, is the change in position or movement of an object which is brought about through the action of a force. Thus in the context of physics, energy is said to be the ability to do work. Work is said to be done, in physics, when an object (howsoever small in size and mass) is moved across a distance, howsoever short, by the action of a force. Mathematically, work is equal to the force multiplied by a distance (more accurately, force integrated over a certain path). The equation above says that the work (W) is equal to the integral of the dot product of the force ( ) on a body and the infinitesimal of the body's translation ( ). Depending on the kind of force F involved, work of this force results in a change of the corresponding kind of energy (gravitational, electrostatic, kinetic, etc). Units of energy are thus exactly the same as units of work ( joules in the SI). Because work is frame dependent (i.e., can only be defined relative to certain initial state or reference state of the system), energy also becomes frame dependent. For example, although a speeding bullet has kinetic energy in the reference frame of a non-moving observer, it has zero kinetic energy in its proper (co-moving) reference frame -- because it takes zero work to accelerate a bullet from zero speed to zero speed. Of course, the selection of a reference state (or reference frame) is completely arbitrary - and usually is dictated to maximally simplify the problem to be dealt with. However, when the total energy of a system cannot be decreased by simple choice of reference frame, then the (minimal) energy remaining in the system is associated with an invariant mass of the system. In this special frame, called the center-of-momentum frame or centre-of-mass frame, total energy of the system E and both its invariant mass and relativistic mass m are related by Einstein's famous equation E = mc². Atoms and molecules, the central concepts of chemistry, are made up of electrons and protons, and therefore coulombic forces are at work during the rearrangement of atoms (during formation or decomposition of molecules). The energy associated with this movement of charge is what we call "chemical energy". A chemical reaction invariably absorbs or releases heat or light. According to chemical thermodynamics a chemical transformation is possible only if so-called free energy decreases. The concept of free energy is a synthesis of energy and entropy. Free energy is a useful concept in chemistry, because energy considerations alone are not sufficient to decide the possibility of a chemical reaction. According to the second law of thermodynamics, the entropy of the universe must increase in all processes (including chemical processes), and energy is transformed from one form to another (including from heat to any other form) so long as the second law is not violated. For example, a gas may expand and thus allow some of its heat to do work, but this is only possible because the net entropy of the universe increases due to the gas expansion, more than it decreases due to the disappearance of heat. The concept of energy levels finds application in various kinds of spectroscopy, in which elucidation of atomic and molecular structure is based on the phenomenon of the presence of certain "lines" in absorption or emission spectra. These lines (so called because they appear as linear features in dispersion spectra (see example above), such as might be produced by a prism or diffraction grating) are postulated to be due to a certain specific amount of energy involved in the transition of atoms or molecules, from one state to another. Because a charactistic magnitude of energy is associated with a characteristic frequency (and wavelength) of light (or other electromagnetic radiation), such lines in spectra are direct clues to energetic changes which are permitted to happen only at certain energies, and not others. The speed of a chemical reaction (at given temperature T) is related to a yet another concept, activation energy. The activation energy E, of a chemical reaction, can be visualized as the height of a barrier of energy separating two minima of the energy of the chemically reacting system (the energy of reactants and the energy of products). Thus, according to statistical mechanics the rate of chemical reactions is proportional to the Boltzmann's population factor e − E / kT, that is the population of molecules having energy greater than or equal to E at thr temperature T. This exponential dependence of a reaction rate on temperature is known as the Arrhenius equation. Growth, development and metabolism are some of the central phenomena in the study of biology. They cannot be explained without invoking the energy concept. Indeed sustenance of life itself is critically dependent on energy transformations; living organisms survive because of exchange of energy within and without. In a living organism chemical bonds are constantly broken and made to make the exchange and transformation of energy possible. These chemical bonds are most often bonds in carbohydrates, including sugars. Other chemical bonds include bonds in chemical compounds that are important for the cell metabolism, for example, those in a molecule of ATP or fats and oils. These molecules, along with oxygen, are common stores of concentrated energy for the biological processes. One can therefore assert that transformation of energy from a more to a less concentrated form is the driving force of all biological processes or chemical processes that are responsible for the life of a biological organism. Molecular biology and biochemistry are in fact scientific studies concerning the making and breaking of chemical bonds in the molecules found in biological organisms. 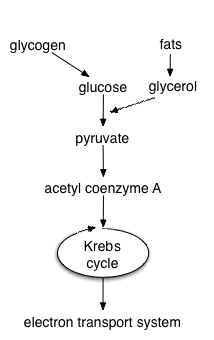 As with other natural phenomena, the exchange of metabolic energy in biological organisms also increases the entropy of the universe. Nearly all energy transformations studied in biology are due to the chemical synthesis and decompositions ultimately brought about by the energy absorbed from photons in sunlight through insolation and photosynthesis. The total energy captured by photosynthesis in green plants from the solar radiation is about 2 x 1023 joules of energy per year . This is about 4% of the total sunlight energy which reaches Earth. The predator-prey relationships, food chains, are in effect energy transformations within ecosystems that are studied in ecology. Meteorological phenomena like wind, rain, hail, snow, lightning, tornados and hurricanes, are all a result of energy transformations brought about by solar energy on the planet Earth. It has been estimated that the average total solar incoming radiation (or insolation) is about 1350 watts per square meter incident to the summit of the atmosphere, at the equator at midday, a figure known as the solar constant. Although this amount varies a little each year, as a result of solar flares, prominences and the sunspot cycle. Some 34% of this is immediately reflected by the planetary albedo, as a result of clouds, snowfields, and even reflected light from water, rock or vegetation. As more energy is received in the tropics than is re-radiated, while more energy is radiated at the poles than is received, climatic homeostasis is only maintained by a transfer of energy from the tropics to the poles. This transfer of energy is what drives the winds and the ocean currents. Like biological processes, all meteorological processes involve transformation of energy from a concentrated form such as sunlight into a less concentrated form, such as far infrared radiation (i.e., heat radiation at the much smaller characteristic temperatures that occur on Earth, and thus is diffused into many photons). However, energy may be temporarily locally stored during this process, and the sudden release of such stored sources is responsible for the dramatic processes mentioned above. For example, the kinetic energy of a snow-avalanche or hurricane is due to the sudden release of energy previously captured from solar radiations. Continental drift, mountain ranges, volcanos, and earthquakes are phenomena that are a result of energy transformations in the Earth's crust. Recent studies suggest that the Earth transforms about 6.18 x 10-12 J/s (joules per second) per kilogram. Given the Earth's mass of about 5.97 x 1024 kilograms, this means that the rate of energy transformations inside the Earth is about 37 x 1012 J/s (37 terawatts). From the study of neutrinos radiated from the Earth (see KamLAND), scientists have recently estimated that about 24 terawatts of this rate of energy transformation is due to radioactive decay (principally of potassium 40, thorium 232 and uranium 238) and the remaining 13 terawatts is from the continuous gravitational sorting of the core and mantle of the earth, energies left over from the formation of the Earth, about 4.57 billion years ago (this sorting represents continuing gravitational collapse of the Earth into the maximally compact object which is consistent with its composition-- a process which releases gravitational potential energy). The magnitude of both of these energy sources decline over time, and based on half-life alone, it has been estimated that the current radioactive energy of the planet represents less than 1% of that which was available at the time the planet was formed. As a result, geological forces of continental accretion, subduction and sea floor spreading, account for 90% of the Earth's energy. 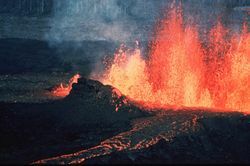 The remaining 10% of geological tectonic energy comes through hotspots produced by mantle plumes, resulting in shield volcanoes like Hawaii, geyser activity like Yellowstone or flood basalts like Iceland. Tectonic process are driven by heat from the Earth's interior. The process is a simple heat engine which works via the upward buoyancy-induced motion of hot, low density magma after expansion by heat. The processes metamorphose weathered rocks, and (more importantly from the energy view) during orogeny periods, lift them up into mountain ranges. The potential energy represented by the mountain range's weight and height thus represents heat from the core of the Earth which has been partly transformed into gravitational potential energy. This potential energy may be suddenly released in landslides or tsunamis. Similarly, the energy release which drives an earthquake represents stresses in rocks that are mechanical potential energy which has been similarly stored from tectonic processes. An earthquake thus ultimately represents kinetic energy which is being released from elastic potential energy in rocks, which in turn has been stored from heat energy released by radioactive decay and gravitational collapse in the Earth's interior. The energy which is responsible for the geological processes of erosion and deposition is a result of the interaction of solar energy and gravity. An estimated 23% of the total insolation is used to drive the water cycle. When water vapour condenses to fall as rain, it dissolves small amounts of carbon dioxide, making a weak acid. This acid acting upon the metallic silicates that form most rocks produces chemical weathering, removing the metals, and leading to the production of rocks and sand, carried by wind and water downslope through gravity to be deposited at the edge of continents in the sea. Physical weathering of rocks is produced by the expansion of ice crystals, left by water in the joint planes of rocks. A geologic cycle is continued when these eroded rocks are later uplifted into mountains. The phenomona of stars, nova, supernova, quasars and gamma ray bursts are the universe's highest-output energy transformations of matter. All stellar phenomena (including of course solar activity) are driven by various kinds of energy transformations. Energy in such transformations is either from gravitational collapse of matter (usually molecular hydrogen) into various classes of astronomical objects (stars, black holes, etc. ), or from nuclear fusion (of lighter elements, primarily hydrogen). Light elements, primarily hydrogen and helium, were created in the Big Bang. These light elements were spread too fast and too thinly in the Big Bang process (see nucleosynthesis) to form the most stable medium-sized atomic nuclei, like iron and nickel. This fact allows for later energy release, as such intermediate-sized elements are formed in our era. The formation of such atoms powers the steady energy-releasing reactions in stars, and also contributes to sudden energy releases, such as in novae. Gravitational collapse of matter into black holes is also thought to power the very most energetic processes, generally seen at the centers of galaxies (see quasars and in general active galaxies). Cosmologists are still unable to explain all cosmological phenomena purely on the basis of known conventional forms of energy, for example those related to the accelerating expansion of the universe, and therefore invoke a yet unexplored form of energy called dark energy to account for certain cosmological observations. The methods for the measurement of energy often deploy methods for the measurement of still more fundamental concepts of science, viz. mass, distance, radiation, temperature, time, electric charge and electric current. 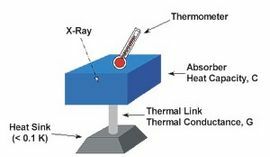 Conventionally the technique most often employed are calorimetry, in thermodynamics that relies on the measurement of temperature: a thermometer or a bolometer for measurement of intensity of a radiation. In the context of natural sciences, energy can be in any of several different forms: thermal, chemical, electrical, radiant, nuclear etc. Some basic textbooks broadly groups all these forms of energy into two broad categories : kinetic energy and potential energy. However, some forms of energy resist such easy classification, as is the case with light energy. Other familiar types of energy (such as heat in most circumstances) are a varying mix of both potential and kinetic energy. Kinetic energy is energy due to motion of a body or particles within it. where k is the Boltzmann constant and T is absolute temperature. Whereas all internal energy is kinetic in an ideal gas at low temperatures, at higher temperatures in gases, and in liquids and solids, there is more energy in vibrations within the molecules. Thus, whenever there is energy due to vibrations, half of it is stored as kinetic energy and the other half in electromagnetic potential energy between particles. Similarly, radiation energy, also commonly known as light energy, is often portrayed as being carried by moving photons and electrical energy is portrayed as being transferred from one place to another through movement of electrons. However, close examination reveals that this is not really true. Radiation energy cannot be neatly categorized as classical kinetic energy, since photons have no invariant mass and thus the energy required to accelerate them to their velocity (and thus which is associated with their motion) cannot be calculated using other kinetic equations. The electrical energy of an electric current is not due to the motion of electrons from one end of the conducting wire to another - simply because speed of electrons on both ends of wire is the same (thus their kinetic energy is the same and can not be the sourse of energy delivered to a load in between). An electric current is in fact induced motion of charges at one end of a wire, by introduction of an electric field at the other. The electric field and the wave of current it drives are established over a conductor with a speed v almost equal to the speed of light (v=c/sqrt(με)≈c/1.83=1.6x10^8 m/sec in household copper or aluminium wires with polyvinil chloride insulation), but conduction electrons move at a tiny fraction of that speed (~0.1 mm/sec at current I ~ 1 A). The energy of an electric current is carried in the electric field and magnetic field of the current - as given by the Poynting vector. If a wire is made of a good conductor, then practically all electric energy flows outside the wire (because electric field and thus Poynting vector flux inside conductive wire are negligible), and it enters low conductive load (where Poynting vector tilts inward). This electric energy flux can be transformed in the load into heat, light, kinetic energy or other forms of energy. In case of small displacement h << r near the Earth's surface where GM/r = g, the above formula results in the widely used E = mgh approximation for gravitational potential energy. ε0 is the electric constant of a vacuum. In use of electrical energy from an electrical wiring system, the electric potential energy available is represented by the electrical potential difference (measured in volts) between the conductors, and the amount of charge which is to be transferred between them. Released energy in joules is given by voltage multiplied by coulombs of charge transferred. Energy can also be stored in a magnetic field. Such fields are intrinsic properties of certain particles, but they also often result from relative motion of electric charges in an electrical current; for example, superconducting magnetic energy storage works via the mechanism of magnetic potential energy. Magnetic potential energy is closely related to electric potential energy, since both types of potential are mediated by the electromagnetic field. High power application of magnetic potential energy is perhaps most familar as the type of energy storage which allows transfer of power within an electrical transformer. Potential thermal energy is the part of thermal energy which is not made up of kinetic thermal energy, and is thus stored as electric potential energy. This potential electrical part of thermal energy is stored in "deformation" of atomic bonds during thermal motion of atoms (as atoms oscillate around their position of equilibrium, they not only have kinetic energy of motion but also a potential energy of displacement from equilibrium). This energy is a significant portion (about half) of thermal energy for strongly-bonded systems (=solids and liquids), with the rest of thermal energy being the kinetic energy of the atoms. However, the potential part of thermal energy is a smaller fraction of thermal energy in gasses, which carry more than half of their thermal energy as various kinds of kinetic energies of the gas atoms. Potential chemical energy is the energy which may potentially be liberated, when the bonds of chemical structures are rearranged. Energy is never stored in chemical bonds except as a negative quantity (i.e., it always requires energy to break a bond), but net energy may be released when weak chemical bonds are broken so that stonger bonds can be made. The mixture of a fuel and oxygen is an example: this stores chemical energy as compared to the products of combustion, i.e., the energy is not stored in the fuel, but rather exists as a potential energy to be converted to heat when the fuel combines with oxygen. Other common examples of chemical potential are a rechargable battery, or a food item (where again the energy is not stored in the item itself, but actually in the system of item-plus-oxygen). Some chemical fuels or explosives (for example, nitroglycerine) do not require a second reactant substance to release potential energy, but even in these cases, the energy released does not come from the bonds of the molecule, but rather is released from the stronger bonds of the products into which it decomposes (in the case of nitroglycerine, from the powerful bond in the new N2 produced when it explodes). Potential elastic energy is the energy stored in the elastic nature of objects. Elastic energy is actually of several types: it is sometimes a kind of electric potential energy (as in metal springs), and in these cases energy is released as charged atoms which have been compressed are allowed to move apart. However, in other cases (such as compressed ideal gases or rubber bands) the potential energy is not stored as electrical potential, but rather is stored as a low-entropy arrangement of atoms which can allow rapid conversion of thermal energy into work, when they are rearranged into higher-entropy structures. x is the deformation of the object. Nuclear potential energy, along with electric potential energy, provides the energy released from nuclear fission and nuclear fusion processes. In both cases strong nuclear forces bind nuclear particles more strongly and closely, after the reaction has completed. Weak nuclear forces (different from strong forces) provide the potential energy for certain kinds of radioactive decay, such as beta decay. The energy released in nuclear processes is so large that the relativistic change in mass can be as much as several parts per thousand. One form of energy can often be readily transformed into another with the help of a device- for instance, a battery, from chemical energy to electrical energy; a dam: gravitational potential energy to kinetic energy of moving water (and the blades of a turbine) and ultimately to electric energy through a electrical generator. Similarly in the case of a chemical explosion chemical potential energy, is transformed to kinetic energy and thermal energy in a very short time. Yet another example is that of a pendulum. At its highest points the kinetic energy is zero and the gravitational potential energy is at maximum. At its lowest point the kinetic energy is at maximum and is equal to the decrease of potential energy. If one (unrealistically) assumes that there is no friction, the conversion of energy between these processes is perfect, and the pendulum will continue swinging forever. Energy can be converted into matter and vice versa, although both energy and matter continue to exhibit rest mass throughout any such process (thus in a closed system, conversion of matter to energy or energy to matter makes no difference in the system mass). The equation E=mc2, mathematically derived independently by Albert Einstein and Henri Poincaré reflects the equivalence between mass and energy. This equation states that the liberated active energy (light, heat, radiation) that is equivalent to a unit of inactive matter is enormous. This can be witnessed in the tremendous energies liberated by a nuclear bomb. Conversely, the mass equivalent of a unit of energy is miniscule, which is why loss of energy from most systems is difficult to measure by weight, unless the energy loss is very large. Examples of energy transformation into matter (particles) are found in high energy nuclear physics. However, all energy in any form exhibits rest mass, even if it has not been converted into new particles. Energy, in the context of natural sciences, is subject to the law of conservation of energy. According to this law it can neither be created (produced) nor destroyed. It can only be transformed. According to the first law of thermodynamics the total inflow of energy into a system must equal the total outflow of energy from the system, plus the change in the energy contained within the system. This law is used in all branches of physics, but frequently violated for short enough periods of time during which energy can not be mathematically defined yet (see quantum electrodynamics and off shell concept). Noether's theorem relates the conservation of energy to the time invariance of physical laws. Despite being seemingly insignificant, this principle has made profound impact on our understanding many phenomena in the realm of particle physics. It led to the introduction of the concept of virtual particles which carry momentum, exchange by which with real particles is responsible for creation of all known fundamental forces (more accurately known as fundamental interactions). Virtual photons (which are simply lowest quantum mechanical energy state of photons) are also responsible for spontaneous radiative decay of exited atomic and nuclear states, for the Casimir force, for Van der Waals bond forces and some other observable phenomena. In the context of society the word energy is synonymous to energy resources, it most often refers to substances like fuels, petroleum products and electric power installations. This difference vis a vis energy in natural sciences can lead to some confusion, because energy resources (which represent usable energy) are not conserved in nature in the same way as energy is conserved in the context of physics. People often talk about energy crisis and the need to conserve energy, something contrary to the principle of energy conservation in natural sciences. Efforts, normally referred to as energy conservation, are actually efforts that are targeted at conserving currently available energy resources that can be applied to do useful work. Energy consumption per capita per country (2001). Red hues indicate increase, green hues decrease of consumption during the 1990s. Production and consumption of energy resources is very important to the global economy. All economic activity requires energy resources, whether to manufacture goods, provide transportation, run computers and other machines, or to grow food to feed workers, or even to harvest new fuels. Thus the way in which a human society uses its existing energy resources, develops means of their production or acquisition is a defining characteristic of its economy. The progression from animal power to steam power, then the internal combustion engine and electricity, are key elements in the development of modern civilization. The cost of energy resources depends on its demand and production at any particular time. Scarcity of cheap fuels is a key concern in future energy development. Some attempts have been made to define " embodied energy" - the sum total of energy expended to deliver a good or service as it travels through the economy. Consumption of energy resources, (e.g. turning on a light) is apparently harmless. However, producing that energy requires resources and contributes to air and water pollution. Many electric power plants burn coal oil or natural gas in order to generate electricity for energy needs. While burning these fossil fuels produces a readily available and instantaneous supply of electricity, it also generates air pollutants including carbon dioxide (CO2), sulfur dioxide and trioxide (SOx) and nitrogen oxides (NOx). Carbon dioxide is an important greenhouse gas which is thought to be responsible for some fraction of the rapid increase in global warming seen especially temperature records in the 19th century, as compared with tens of thousands of years worth of temperature records which can be read from ice cores taken in artic regions. Burning fossil fuels for electricity generation also releases trace metals such as beryllium, cadmium, chromium, copper, manganese, mercury, nickel, and silver into the environment, which also act as pollutants. Certain renewable energy technologies do not pollute the environment in the same ways, and therefore can help contribute to a cleaner energy future for the world. Renewable energy technologies available for electricity production include biofuels, solar power, tidal power, wind turbines, hydroelectric power etc. However, serious environmental concerns have been articulated by several environmental activists regarding these modes of electricity generation. According to them, some pollution is invariably produced during the manufacture and retirement of the materials associated with the machinery used in these technologies. A central way to avoid downsides of expanding energy production is energy conservation. Scientists have realized that the known energy resources may not suffice forever, there is thus an urgent need to explore new avenues, which include prospecting for newer territories rich in oil or gas or methods for producing energy resources using methods that have been explored very little.While some scientists are busy in exploring the possibility of cold fusion many countries are diverting significant economic resources towards space exploration . Space exploration of long duration demands compact energy resources because the huge consumption of energy resources by a large size spacecraft cannot be met by chemical portable energy resources carried on board from the Earth. For missions to the outer solar system, compact nuclear power sources (in the form of nuclear reactors or radioisotope thermoelectric generators) are a necessity. It has been proposed to explore annihilation of matter for this purpose, although no practical way of producing significant amounts of antimatter, or storing them is presently known. Yet another field of research to explore a future source of energy is through artificial photosynthesis, a process being actively researched to convert the carbon dioxide into useful fuel, other than biomass without the intervention of plants. Since the cost of energy has become a significant factor in the performance of economy of societies, management of energy resources has become very crucial.Energy management involves utilizing the available energy resources more effectively that is with minimum incremental costs. Many times it is possible to save expenditure on energy without incorporating fresh technology by simple management techniques. Most often energy management is the practice of using energy more efficiently by eliminating energy wastage or to balance justifiable energy demand with appropriate energy supply. The process couples energy awareness with energy conservation. Since energy plays an essential role in industrial societies, the ownership and control of energy resources plays an increasing role in politics at the national level. Governments may seek to influence the sharing (distribution) of energy resources among various sections of the society through pricing mechanisms; or even who owns resources within their borders. They may also seek to influence the use of energy by individuals and business in an attempt to tackle environmental issues. Producing energy to sustain human needs is an essential social activity, and a great deal of effort goes into the activity. While most of such effort is limited towards increasing the production of electricity and oil, newer ways of producing usable energy resources from the available energy resources are being explored. One such effort is to explore means of producing hydrogen from water. Though hydrogen use is environmentally friendly, its production requires energy and existing technologies to make it, are not very efficient. Research is underway to explore enzymatic decomposition of biomass. See hydrogen economy. While energy resources are an essential ingredient for all modes of transportation in society, the transportation of energy resources is becoming equally important. Energy resources are invariably located far from the place where they are consumed. Therefore their transportation is always in question. Some energy resources like liquid or gaseous fuels are transported using tankers or pipelines, while electricity transportation invariably requires a network of grid cables. The transportation of energy, whether by tanker, pipeline, or transmission line, poses challenges for scientists and engineers, policy makers, and economists to make it more riskfree and efficient. Look up Energy in Wiktionary, the free dictionary. Look up Energy in Wikinews, the free news. Look up Energy in Wikiquote, the free quotations. Look up Energy in Wikibooks, the free books. Look up Energy in Wikisource, the free source. Look up Energy in Commons, the free repository. Look up Energy in Wikispecies, directory of species.